Fancy Getting Your Hand On a Gold iPhone 5 Case? 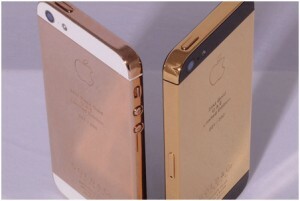 If you do, then be prepared to pay the jaw dropping figure of between $4,500 – $5,000, as London based Gold & Co launch the first exclusive 24 carat iPhone 5 case for all those rich trendsetters out there. At the moment here are just the two cases which are set to go on sale. For $4,500 you can get a yellow gold and black case, and for an extra $500 you can get a rose gold and white model. They come in a wooden hand-crafted box with a certificate of authenticity much like the iPad 2 and iPad 3 cases that the company offered 24 carat cases for earlier this year, and last year. Unfortunately for those looking to buy, at the moment they are only available at Gold & Co’s authorised dealers which are in the Middle East, India, and in the main G&C London office situated in Hong Kong. What do you think of these cases? Nice aren’t they? Think I’ll stick with a $5 case for now though!